Heirloom Herb. Cumin seeds produce a plant that is a medicinal/culinary spice and a main ingredient of curry. 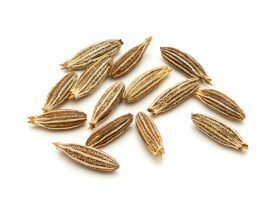 Cumin has a very distinctive taste. As it requires a long, warm growing season to mature properly, we suggest starting the seed early indoors. Cumin matures to a height of 45 cm (18″). 30 seed/gram. Soaking seed for 8 hours before planting can aid in germination. In long growing season areas, direct-sow seed 3 mm (1/8″) deep and 15 cm (6″) apart in a sunny site. Thin seedlings to 20 cm (8″) apart. Seed can also be started indoors in a soil-less growing medium 4 to 6 weeks early. After hardening off, transplant seedlings outside after the danger of frost has passed.